hackster.io‘s ‘resident hardware nerd’ Alex Glow has gifted the world of makers with Archimedes, a shoulder-mounted owl that judges your emotions using the Google AIY Project Vision Kit. Say hi to Archimedes – the robot owl with a Google AIY brain. Built with Raspberry Pi + Arduino! Here are some insights into pitfalls of the build process. I made this li’l guy to demo the AIY Vision Kit for Maker Faire 2018… but he’s not going away anytime soon! Google released the Pi-powered AIY Projects Voice Kit last year, providing the entire set of build ingredients with issue 57 of The MagPi Magazine. You loved it, we loved it, and later that year they followed up the Voice Kit’s success with the Vision Kit, also based on the Raspberry Pi. As the name indicates, the Voice Kit completes tasks in response to voice commands, just like Amazon Alexa or Google Home. The Vision Kit allows makers to experiment with neural networking to implement image recognition in their projects. When the hackster.io team was asked to contribute a project to Google’s stand at Maker Faire Bay Area this year, their in-house self-confessed hardware and robotics nerd Alex Glow took on the challenge. I took a really, really long time to figure out what to build — what it would look like, how it would animate, how it would dispense the stickers…in the end, I went with this cute and fairly challenging design. And so, Alex brought Archimedes the robotic owl into the world — and the world is a cuter place for it. Having set up the Google AIY Vision Kit — you can find Alex’s live build video here — she raided a HackerBox for a pan/tilt gimble. The gimble was far more robust than simple servos, and since Alex wanted to bring Archimedes to more events after Maker Faire, she needed something that would take the wear and tear. For Maker Faire, she modified Archimedes to be a shoulder-mounted familiar, but Alex initially mounted him on a box that would open to reveal a prize if Archimedes detected a certain facial expression. For this, she introduced an Arduino into the mix, using the board to control three servos: two for the gimble and the third for the box lid. Archimedes’s main objective is to hunt out faces and read their expressions. Because of this, his head is always moving so he can take in his surroundings like a real owl. Alex designed the owl’s body using OnShape, with the intention of keeping the Raspberry Pi and AIY tech inside. Then she 3D printed the body using the Lulzbot Taz 6 and very hackster-blue filament. For full instructions on building and coding your own Archimedes, head to Alex’s hackster.io project page. You can keep up to date on the pair’s adventures via Alex’s Twitter account. 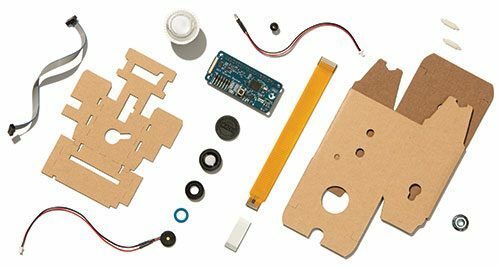 Any news on the UK availability of the Google AIY Vision Kit? Easter has been and gone, and whilst it looks like it has amazing potential, we’re all still waiting patiently to get our hands on one..!